When using git config --global to set things up, to which file will it write? git config --global core.editor "blah"
I have not set an ENV? You will see which config is set where. See "Where do the settings in my Git configuration come from?" For writing options: write to global ~/.gitconfig file rather than the repository .git/config. That means the file is in C:\Users\MyLogin\.gitconfig for Git in Windows 7. 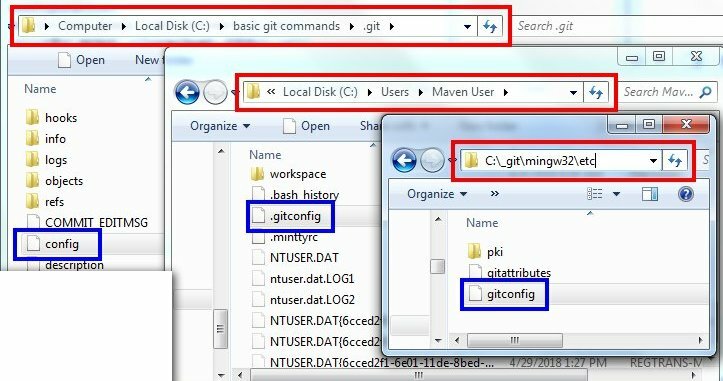 I was also looking for the global .gitconfig on my Windows machine and found this neat trick using git. On *nixes, it's in ~/.gitconfig. Is there a corresponding file in your home? The global location is derived, on Windows MsysGit, using the HOMEDRIVE and HOMEPATH environment variables, unless you have defined a HOME environment variable. The is detailed in the 'profile' script. In my corporate environment the HOMEDRIVE is H:, which is then mapped to a network URL \\share\$. The whole lot is then mapped to be "My Documents", which isn't where others would expect. There may have been some further problems with the drive to URL remapping. I don't even get to adjust the HOMEDRIVE or HOMEPATH variables anyway. In my case I have defined a personal HOME environment variable and pointed it to D:\git\GitHOME and copied all those GIT files (which are without and extension) to the GitHOME directory for safe keeping. The windows environment variables can be set via the Advanced tab in the My Computer properties dialog. to open the global .gitignore file. But if you use your Windows (7) PC in a domain your profile dir is may be a network share (mounted as a drive). In this case TortoiseGit (at least:1.6.5.0) is pointing you to the wrong dir (on c:...). See the closed TortoiseGit issue 922 for more information. Or using %HOMEDRIVE%%HOMEPATH% to open the dir that contains the .gitignore file. But the one that is used is the one from %USERPROFILE%\.gitconfig. Each of these can contain their own set of commands to execute, at the time described by their respective filenames. I don't know where it came from... But now everything works like a charme again. Obviously substitute your user name and presumably the suffix after PortableGit_ is a unique GUID or similar. When is the global .gitconfig file created? First off, git doesn't automatically create the global config file (.gitconfig) during its installation. The file is not created until it is written to for the first time. If you have never set a system variable, it will not be on your file system. I'm guessing that might be the source of the problem. One way to ask Git to create it is to request an edit. Doing so will force the file's creation. If you monitor the user's home folder when you issue this command, you will see the .gitconfig file magically appear. Where is git configuration stored? Of course, seeing is believing, so here's an image showing each file and each location. I pulled the image from an article I wrote on the topic. Uninstall Msysgit and install Cygwin + Git. Then global '.gitconfig' will be here: C:\cygwin(64)\home\[userName]\.gitconfig . Now you don't have to worry about an environment variable which may be used by other programs. For example, my environment variable pointed me to a mapped drive in my work windows domain environment. I dont want my global .gitconfig sitting on my "home" mapped drive. I also don't know what might happen to other applications that might rely on that windows environment variable. Operations division might need that environment variable set to the mapped drive for a reason. Also you don't have to worry about Mysysgit overwriting your 'profile' configuration settings if you specify a specific path to global '.gitconfig', using this method. In other words, the file was located in C:\Users\MyLogin\.gitconfig\.gitconfig, instead of on C:\Users\MyLogin\.gitconfig (which is where Git was looking for the files). Git for Windows supports four levels of configuration. At the lowest level is the machine specific configuration settings known as "portable" and lives a "%ProgramData%\Git\config". One priority level us the installation specific configuration settings known as "system", which live at "\mingw64\etc\gitconfig". Both of these configuration file, generally require elevated privileges to modify. Starting with the use specific values known as "global" configuration, which can be found at "%UserProfile%.gitconfig", we find the "user editable" configuration files. The highest priority configuration settings are in the "local" configuration, which can usually be found at ".git\config". It see the recommendation in the blog linked is to modify the "system" or "installation" specific configuration settings, which is fine but users should expect that other installations of Git would not absorb said settings. If you want machine wide settings, use the "portable" configuration file, otherwise choose the "global" or "local" configuration files. Hopefully, people find this information useful. Not the answer you're looking for? Browse other questions tagged git config or ask your own question. When you set a global configuration option for git on Windows, where does it get written to? Where do the settings in my Git configuration come from? Where should I place my global 'gitattributes' file? Why does `git push -f` force push ALL of the tracking branches? Is it possible to diff PowerPoint version-controlled with git?